When I got home from the gym last week (before the old earache surfaced and a few days before the accident), I walked in to find the cutest scene. There, standing at the kitchen counter chopping celery on the small wooden cutting board, stood the Pres. He was making tuna salad. Looking beyond him, my eyes immediately noticed our friend, Luke, who was in his socks and actually wearing his glasses, which he rarely does. I no sooner closed the door and the Pres said, "Just in time, Hon. Want a grilled tuna and cheese sandwich?" "Absolutely" came out immediately followed by "with dill pickles and chips on the side." Luke chuckled, looking up from the DR table. He was working on what is now known as "the masterpiece." That day, the three of us finished it together, trying to jam in the last twenty or thirty pieces laughing as we replicated the efforts of the Prince in Cinderella, trying on the glass slipper on all the maidens' feet. It really is beautiful, so we (the three of us) decided we are going to save it, as some of my readers had suggested. We picked up a big bottle of Mod Podge Puzzle Saver to get the project started and the Pres, with Luke's help, will make a frame for it. So lets see. 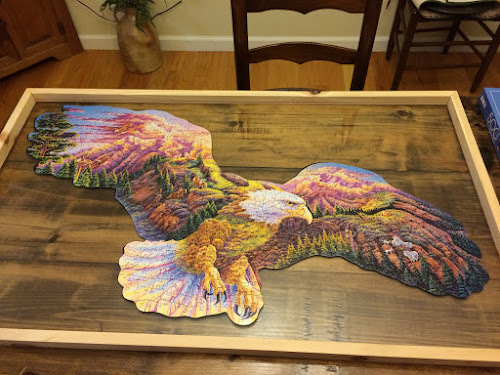 Remember, the puzzle cost me $2.00 at the Senior Center tag sale. The Mod Podge Puzzle Saver was $6.97. The backing was OUTRAGEOUS!! The wood to build the frame was $29 and change plus the time and effort the Pres and Luke put into it. I'd be saving it too. Great job. Well, it is a masterpiece, and most impressed my little puzzle junkie. It was a labor of love despite the cost and now you will always remember it, and of course NOT have to put it together again, JP! JP, Love the masterpiece. It turned out really well and keeping it together is very good. A team effort always feels good. Sylvia D.